When you try to view the Documents and Setting folder in Windows 7, an â€œAccess is deniedâ€ error message will be displayed. In order to view this folder, you need to set the folder view options so that system files and folders are viewable. Once you can view the folder, you will see that the folder icon has a pad lock image added to it (see below). This folder doesnâ€™t exist in Windows 7. Its a symbolic link to another folder and was included here for compatibility with Windows XP. When you save files to Documents and Settings, they are actually saved in the C:\Users\username folder. 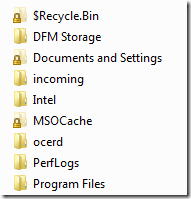 If you delete temporary files manually in Windows, you will find most of these are in the C:\Users folders. The Local Settings folders is now called AppData (just like in a Visual Studio project). You can find temporary files to delete in these folders. I had complaints from customers that the Viewed column in the Notification RSVP Status Results wasnâ€™t updated when they sent out a notification (see below). Normally, there should be a date and time when the customer clicked on a link in their notification e-mail that lead them to the planroom. The problem is that if you set the e-mail link to go right to the project, the Viewed column wonâ€™t be updated. This column will only be updated if the URL will take you to the Display HTML page in the notification. The URL needs to point to (%NP:NotificationURL%) to open the Display HTML page and then the Viewed column will be updated with the date and time they entered that page. The notification that you create may not necessarily require a Display HTML page and should go directly to the DFS project. In situations like this, its best to direct the link to Display HTML, and then in that page redirect the user automatically to the project with (%NAN:Project URL%) as the URL. The notification will need Project URL defined in the Attributes tab. The only required fields that should be set are Type = Text and Length = 200. Notifications will then update the Viewed column in RSVP every time a user clicks on a link to enter a project. They wonâ€™t see the Delivery Message because it has no content to display. Below is an example of URL redirection. The Delivery Message is an e-mail the customer receives and when they click on the link, it will take them to their project. The e-mail only sends the customerâ€™s user name and password to use their planroom. There is no need for a Display HTML page and the client should be go directly to the planroom when they click on the enter planroom link. The link here will open the Delivery Message which then redirects them to the Project using Refresh in a metatag.